Hi, it's my first time using TestDisk, and I'm kind of desperate because the data on my drive is rather important. Trying to open the drive gives me a CRC error under Windows, and when I analyse using TestDisk, I get the message as attached. Hope you guys can help me! Really appreciate any assistance you guys can give! Your current partition table doesn't match at the moment. Did you use the 64bit-version? Because you selected your drive and not your disk? Drive is what you see in your explorer, disk is physically. It's recommended to use TestDisk6.14-32bit. Please let me know what version did you use? Thanks for the quick response! I used the 32bit version and I was able to locate my partition and everything. I'm copying the files to a backup disk as I type this. 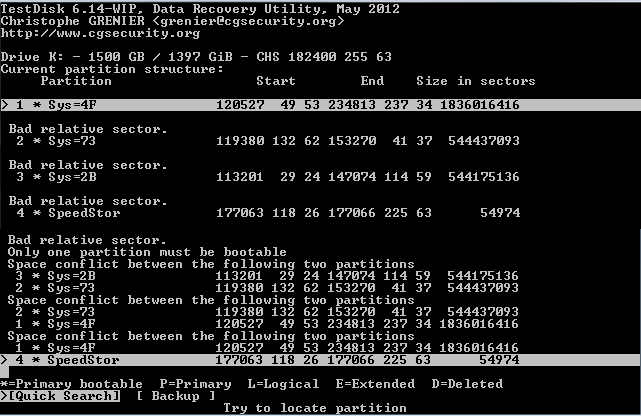 Just to check though, is there a way to rebuild the partition without losing data? Might be possible to rebuild your partition without loosing any data. Could you repeat your diagnose and zip and upload the testdisk.log? You can copy and paste the content also. Important is the menu Analyse (your current partition table), your found partition and to list your data. If testdisk would found your cause (example partition table is wrong), it would be possible to write your partition to your partition table and your problem should be fixed. Hi, I've attached a screenshot of the Analyse and Quick Search results. What should I do to fix the partition?